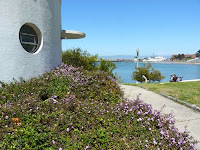 I breezed through the Aquatic Park/San Francisco Maritime National Historical Park area on a previous walk. I returned to this area today, to visit the Maritime National Historical Park Visitor's Center and the Maritime Museum (Bathhouse), and to walk out to the end of the curved breakwater/pier. The Visitor's Center was worth the stop. The entrance was located on Jefferson St., across the street from the Hyde Street Pier -- roughly where the double yellow/gold lines turn into a solid red line on the Bay Trail Map. Part visitor center and part San Francisco Bay history museum, the space and exhibits were well put together and provided a good perspective on the California Gold Rush in the mid-1800s, as well as other major developments that shaped the waterfront. Exhibits dated back to the days when the locals traversed the Bay in tule boats -- and there was, in fact, a tule boat on display. Also of interest were pictures of Italian feluccas, Chinese junks, old ferry boats -- and information and pictures explaining the role these boats played in the evacuation of San Francisco immediately following the earthquake and fires of 1906. 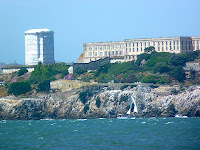 After I exited the visitor center, I crossed the street, walking north toward the water. 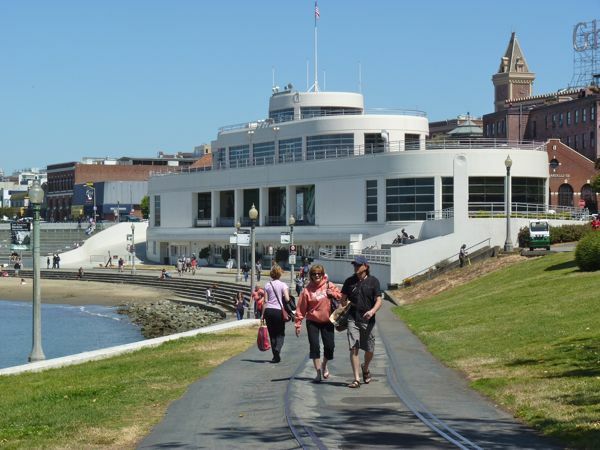 I turned left (west) and continued on to the paved Promenade path (solid red line on map, shared pedestrian and bike path) that hugged the shoreline, along the beach, and out to the end of the curved breakwater (Municipal Pier), passing fishermen and a few tour groups on Segways. The end of the pier provided one of the closest viewing points (on land) so far to Alcatraz Island, and also offered good views of the city skyline. On a clear day, you should be able to see Coit Tower on top of Telegraph Hill and the Transamerica Pyramid in the distance, and the nearby Ghirardelli Chocolate sign and square, located a short distance up the hill from the water. 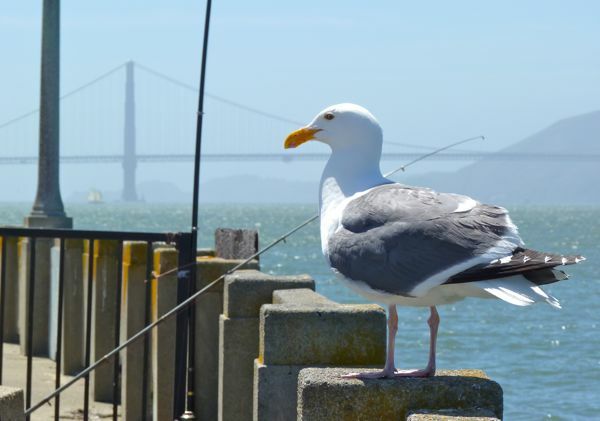 The Golden Gate Bridge is also visible on a clear day. 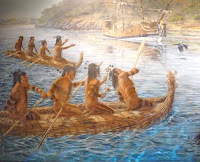 On the way back I stopped at the Maritime Museum (Bathhouse). 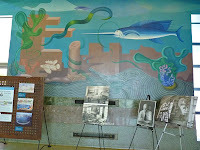 There were no tanks of fish, and few exhibits on display (other than some nice ship models in glass cases). 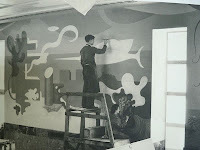 Rather, in the large open area (with great acoustics), the public can view large, painted murals that covered the walls. 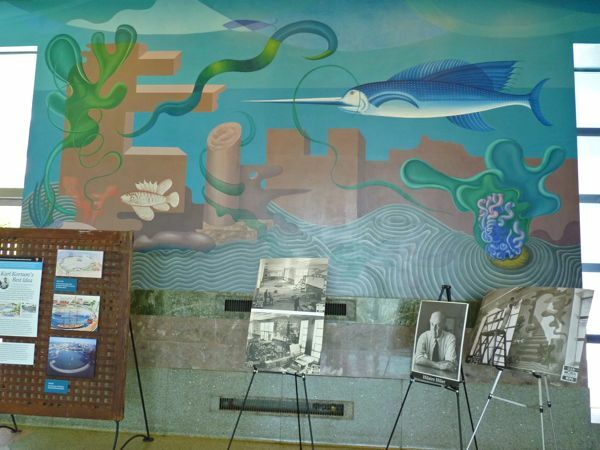 These colorful murals were preserved from the 1930s, when funding for WPA projects resulted in a number of significant public art works in the San Francisco area. 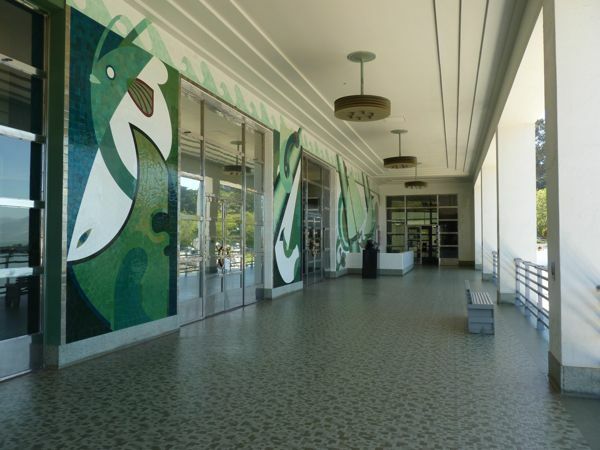 Visitors can step out through doors to a second story balcony of this art deco style building (with attractive curves), and gaze out over the beach and Aquatic Park. 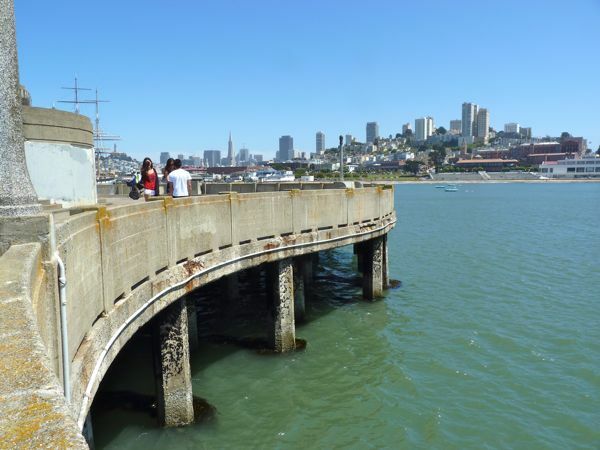 You may see swimmers in the Bay below, from the Dolphin or South End swimming/rowing clubs. Or one can look at the large works done with tiles, covering outside walls behind you. On the way back to Jefferson Street, I walked by Victorian Park, a large, grass-covered area, where several people were sitting and enjoying the sunshine.